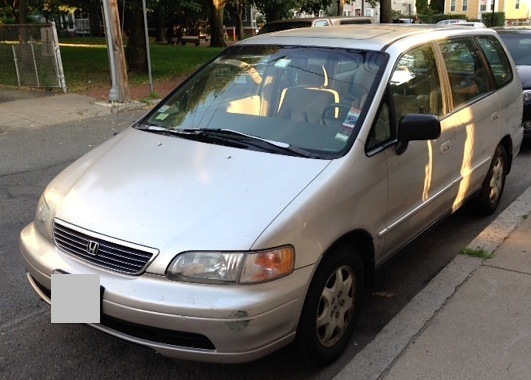 Mrs. Frugalwoods and I own one car: a cosmetically-challenged 1996 Honda Odyssey minivan. The Frugalwoods-mobile doesn’t have a name (other than somehow being a she?) but she does have 201,000 miles! Despite her advanced age and mileage, she gets us where we need to go with a modicum of trouble. In the 3 years we’ve owned her, we’ve only spent $350 on maintenance… and that was mostly for consumables like oil, filters, gaskets, and brakes. 201,266 miles and still going strong! And then there’s her amazing cargo space. Oh the cargo space! The middle seats are removable and the back seats fold flat. Suddenly you no longer have a van, you have a covered pickup truck that gets 25 MPG! We’ve stuffed so many things in the back of the van that it’s hard to keep count. Almost all of our furniture found its way home from the wilds of Craiglist courtesy of this van. When we tell people that our couch fit in the back, they don’t believe us. Well, I’m here to tell you it did AND the rear door closed! Even with the legendary Honda 4 Banger engine under the hood and a tolerance for body rust bordering on appreciation, some day we will be forced to move on and I’m a planner. I like to have contingency plans for contingency plans. So, I’m on a quest to determine what we’ll do when the van bites the dust (other than mourn and PANIC!). This is Part 1 in a series on our journey to frugally and judiciously prepare for that fateful day. Good Value: We’re looking for something we’ll be able to drive for 8 years or more that’ll cost less than $9,000. We’ll be paying cash outright since we don’t believe in financing a vehicle (if you need to be scared straight on this front, check out Club Thrifty’s Why Do People Choose to Be Car Poor?). Much less would be good ‘natch, but we’re also mindful of the total cost of ownership and so are willing to pay near the top of our range for a vehicle that won’t need much maintenance over the long-term. Fuel Efficient: We love to hike and explore, which is great frugal entertainment except for the price of gas. Reducing the amount we spend on gas would be nice on the wallet and would likely spur us to adventure more often. Good Cargo Space: I realize this is a tradeoff with fuel efficiency, but we do take advantage of the van’s awesome cargo capacity on a regular basis. Most of our belongings are second-hand from Craigslist, garage sales, or the side of the road and Frugal Hound, at 60 pounds, takes up a lot of room! We’re willing to sacrifice in this category and get something smaller than a van. Maybe a trailer is in store for the future? Why am I still in the back of the car? 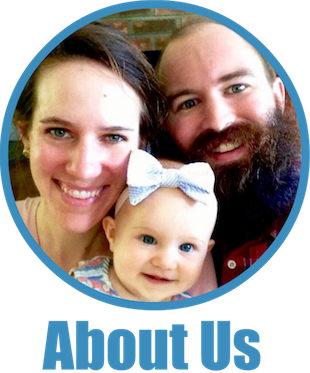 Good Passenger Space: We hope to add kiddos to the Frugalwoods roster before too long, so we’ll need a backseat that can handle a car seat or two. Safety Systems: The van has airbags and anti-lock brakes. And seat belts. This was the height of safety technology in 1996. I think we can do a little better in our next car. History of Longevity: We’re spoiled rotten by our van in this regard, and it would be fabulous to get another car that hits 200k miles without any major problems. Parts Availability: A close corollary to a good maintenance history is the availability and cost of parts for repair. Our history shows we aren’t averse to taking a car to age 18 and beyond, so making sure parts will be available for a long time is useful. Part (hah! pun!) of this is the brand reputation, and part (!!) is the volume of the model produced. Junkyard parts are great, but usually aren’t available for rare cars. Front Wheel Drive: We live in the Boston area, so our winters are snowy. The city does a good job of clearing the roads and we’ve never had a problem with the van. So, no need for four wheel drive. We don’t even put snow tires on, though we probably should. Robust Used Market: We’ll buy this car used (of course!) so we want something commonly available in the used market and easy to value. Easy to Park: We live in the city and don’t have a driveway, so we parallel park on the street every day. For all of the van’s many admirable attributes, ease of parking is not among them. Something slightly shorter would help us slip into the super tight spaces that we currently have to pass up. What don’t we need in a car? Fancy Electronics: Bluetooth? Don’t need it. GPS? We have our phones. Automatic doors and windows? More stuff to break. Heated seats? Ok, that’d be pretty nice come February! Warranty: I’m generally of the opinion that warranties or certified pre-owned are just a tax on worriers. We’re fine buying a car in a private party sale and having it checked out by our trusted mechanic. Status Symbol: Uh, no. We aren’t exactly cruising the ‘hood in our hoopty… Plus, this would be counter to the entire Frugalwoods philosophy. Sporty: 0 to 60 in 30 seconds? That’s cool as long as it gets 40mpg. Alarm: We live in a decent area and use the Club on the steering wheel. Targeted to Our Demographic: If a PT Cruiser checks all the boxes, we have no problem being the only owners under 70. In Part 2 of this car mini-series, I’ll illuminate the research I’ve done thus far and the cars that’ve made our short list. Until then, tell me what car we should consider. Are you a die hard Pontiac Aztek fan? Let me hear it! Do you have 400,000 miles on your Isuzu Trooper? Tell us! And, give us the skinny on cars to avoid. Did your ’99 Saturn die in a ball of flames after 15K miles? We need to know! We have a Mazda 5 (mini-minivan)? We like it because they are a lot cheaper than a normal minivan, have sliding doors (very convenient with small children) and lots of space. Our has 80K miles on the clock and has been good to us. Our other vehicle is a 2003 Honda Element with 130,000 miles. We had one caliper seize up, but otherwise, it has been solid. I like the fact that I can take the back seats out and haul 4×8 pieces of plywood or drywall. I like your Odyssey too! Ever listen to the old CarTalk show on NPR? One of them had your Odyssey and used to frequently rave about it. If I had to get another car, I’d seriously consider a Honda FIt. You can do all kinds of crazy stuff with the configuration. If you need more storage, just install a hitch and get a tailgate carrier. We live about about a mile from “Dewey Cheatem and Howe” and love car talk! Our mechanic, while being no where near as funny as the Tappet brothers, loves our car and always tells us we could get another 50k miles easy. We’ll see! 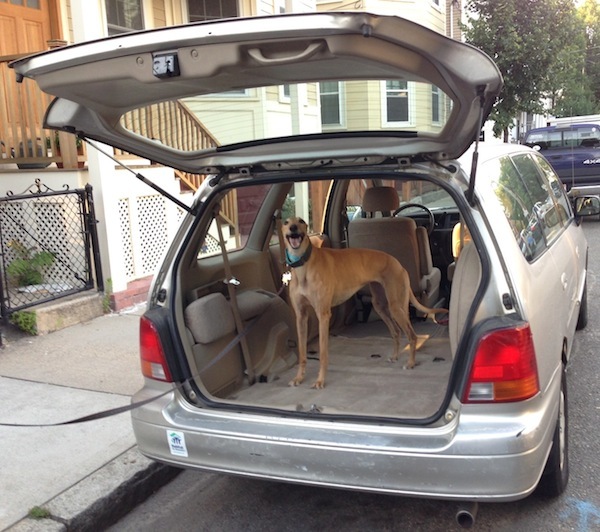 Back before we had the Odyssey we used Zipcar on occasion and often picked a Fit. They are amazing! The used market for them is less amazing though. People love them too much! I’ll have to look into the Element and the Mazda 5. Thanks for the suggestions! While Mr. 1500 thinks there is a lot of room in the Mazda 5, his vision is clouded. It does seat 6, but when there are 6 people in it, there is about 8 inches of space behind that third row of seats. You are NOT picking up family at the airport in this baby, unless you have a roof top carrier or a tail gate carrier. Also, unless you have legs like a penguin as I do, you will not be fitting into that far back seat. We have friends who were looking for a new car. She is 5 feet 12 (she refuses to say 6 feet, as though being 5’12” makes her shorter) and he is 6’3″. They will most likely make tall kids, so this wasn’t the car for them. The Element, I cannot say enough good things about. 3 drawbacks. 1. The passenger door doesn’t have an unlock switch, so when your loving husband opens your door first, you have to lean waaay over to open his for him. Easily solved by getting a key fob, which unlocks both doors. 2. Only seats 4. No way around this. 3. Enormous space between front and back seats makes it difficult for above-mentioned penguin-legged woman to put infant car seat into the back seat. Not a long-term problem. Hmmm, so your husband’s vision is sometimes clouded too ;)? I’m sure Mr. Frugalwoods has no clue what you’re talking about…hah! The Element is a good car for tall people. Next time you’re out and about, look at them on the road. You’ll notice that there seems to be about a foot of room between the top of the driver’s head and the roof. I still vote for the NSX. We also have a Honda Odyssey ’01 nicknamed “the beast” which has 155K miles on it. I agree that it is like a covered pick up truck. I can stand up inside of it (granted I’m only 5 ft). We just hauled a dryer in it and we would miss the hauling capacity. We haven’t really been impressed with the gas mileage (17 in winter in the Northeast, 20-22 in the summer) but I believe the V6 is the reason for that. When it’s time to replace it, we would consider a small SUV with a trailer hitch but hopefully “the beast” will be around until the kids are out of college! The Beast! Honda sure had some magic during that generation of vans. I know it wouldn’t be exactly what you’re looking for because they don’t have great cargo space, but we’ve had Honda civics and accords in my family for a long time and each of them have lasted forever and have gotten really good gas mileage. I don’t know much about their SUVs or vans, but I’ve heard good things from friends. After our current amazing Honda van we’re certainly predisposed to the Honda brand. 16 years old and absolutely no problem getting reasonably priced parts! One thing that sort of concerns me about newer Hondas is their reputation for being a theft magnet. I know there have been a couple of Fits that had their wheels stolen in our town in the past year. I guess I’d have to learn about anti-theft measures beyond the Club if we got one of those. The accord is a pretty roomy car, maybe not for cargo but definitely for people. It’s a good point that we should scrutinize how often we _really_ use the cargo capacity. Maybe a jankity trailer would suffice! Oh, and my previous car was an ancient Acura Integra (rebadged Honda Accord). I LOVED that thing. I bought it for $2400 with 130,000 miles on it and sold it for $1600 with 230,000 miles on it. There was nothing wrong with it either; I just too many cars. It was indestructible. One day, it was in a flood (3′ of water). It was completely soaked and I thought that was the end for sure. Since it was old, I only had liability insurance on it, so I decided to see if I could get it working. I turned the key and a bunch of water shot out the exhaust pipe. After about a minute, it started. We vacuumed the water out of the seats with a Shop-Vac and aired it our for a couple days. A week later, you’d never know anything happened to it. Like I said, indestructible. 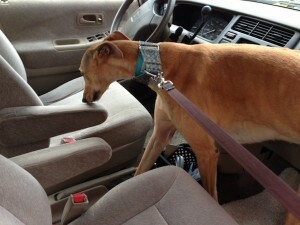 We carry our greyT girl in a Toyota Rav4. It suits her perfectly and it’s a reliable car for us. We bought it used, of course. Thanks for the recommendation! We do love Toyotas. My only other car was a 1990 Toyota Camry station wagon–talk about a great vehicle! Good to know that your greyhound fits in the Rav4! 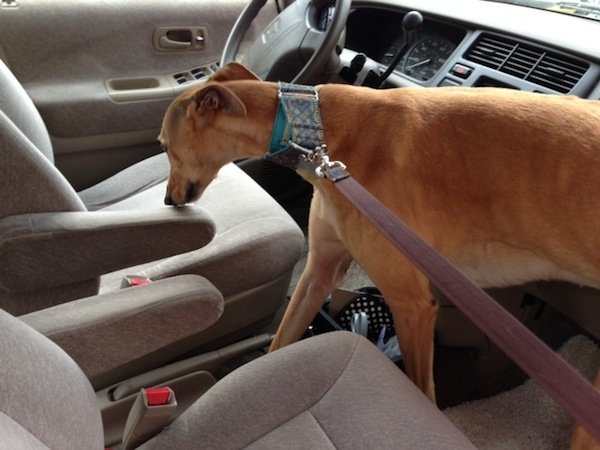 We drove to a friend’s house with Frugal Hound yesterday and I was reminded of how tall she is and how much space she takes up in the back of the van. Yes. They are tall! Our girl stands up easily and still has lots of head room, despite being a large brindle female. It was a pleasant surprise, especially since we had the Rav4 before getting our beautiful girl. Oh I love the brindles! They’re so gorgeous! But yea if you move out to the woods somewhere I would def look at a subaru forester or outback. We love the Fit. One problem around here is that people love them so much that there isn’t a large used market! Definitely going to include the fit in the decision matrix though, thanks! I loved this post! I feel like I know you better already. I loved the part about the 0-60 time. Fun fact: it only takes about 40-60 hp for a car to drive at highway speeds. Crazy to think most SUV’s nowadays have 200+!!! My last car made it to 308,000 before she got totaled. Still ran great! 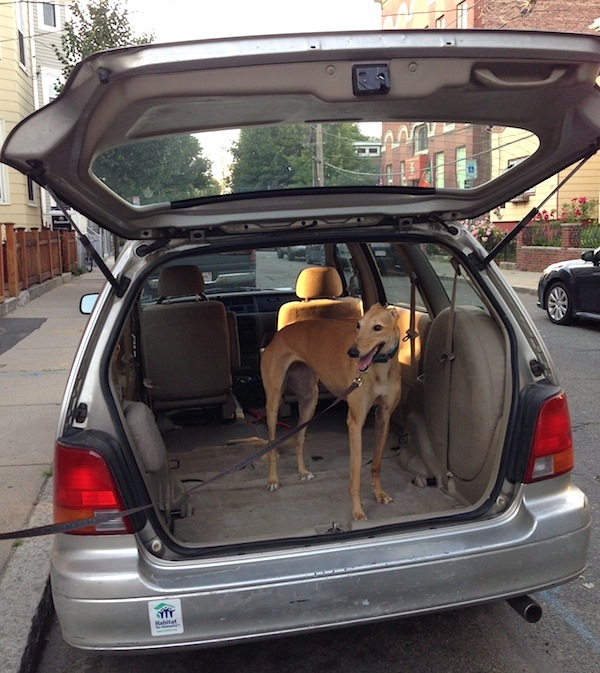 You love dogs which means you would probably love a Subaru (stereotype alert). If I was going to get a big vehicle, I would be tempted to buy a Subaru. Subies are really popular here in New England. Decent gas milage, good in the snow, can haul a decent amount of stuff. Anecdotally they don’t get great marks on reliability, but I should really research that some more. Thanks for the link, that’s a classic! Really? I think you just have to avoid a few years and models that have timing belt issues or other stuff. Both my hubby and I have Subarus (he a 99 Outback, me an 02 Forester), also very popular in the Cascades of Washington state, and have lots of friends who do. Other than replacing things that are due to be replaced, we haven’t had a single issue that made me question their reliability (anecdotal, I know but don’t discount them without doing some research). In terms of how we have used them, we lived for five years at the top of a mountain pass where we had snow and ice on the ground for the better part of the year and had a 45 min drive to town. Luckily we commuted by foot across the street to the ski area for most of the year so each auto took 1-2 trips to town and back per week in the winter a few more in the summer. I have 177k on mine and he’s nearing 250k. We LOVE them and I would need some serious convincing to switch to another vehicle for the kind of driving and outdoor lifestyle that we have. 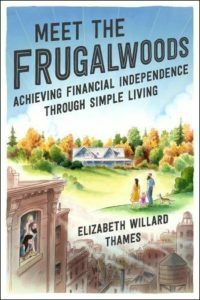 Thanks for your great blog, I discovered it through MMM and FI in Big Sky the last couple of weeks and am loving some of the younger, not yet FI perspectives from others in their early 30s. Cheers. A couple of Subaru owning friends have grumbled about parts cost… but then again who knows if they shopped around. A subaru is definitely still on the possible list. The addition of AWD also gives me pause. Would it be nice to have in the winter? Yes. But 9+ months of the year we’re taking on decreased MPG and a more complicated powertrain. Still haven’t made up my mind if it’s worth it. We love our ’07 Forester and we’ve had it since it was a brand new little baby. Just crossed 100k miles with only routine service and we’ve now passed it on to our daughter. So that’s a measure of my confidence in it. When we bought it, given where we lived in NH, we needed the AWD for the steep, snowy hills. But now we don’t and AWD is a lot of extra weight to haul around if there is no need. We replaced it with a Mazda 3, which is a great little car, but little is the operative word. maybe a bit too little for us. So we’ll be reading this thread of yours with interest! Good to know on the forester! We’ve gotten along OK here in the city with the front-wheel-drive van… but in the next couple of years as we get closer to buying a country place we’d probably appreciate AWD. I’ve looked at a Mazda3 before, they do seem like great little cars. They are also fun to drive, so that’s always a plus! Have you driven a Honda Fit? They are in a similar size class to the Mazda3 but they are a bit bigger inside. Nowhere near as fun to drive though. How have you only spent $350 on this vehicle? Did you do all the maintenance yourselves? Oil changes, breaks, timing belt. Never had to change the battery? I’m going to run my Accord into the ground, but there’s no way I could get away w/ $350 worth of maintenance. 1) We don’t drive it very much. We’ve put 17,000 miles on it in 4.5 years. 2) We drive it gently. Oh that’s awesome! Gotta love these Honda Odysseys! They are just excellent cars. I’m heartened to hear that your friends’ ’95 is still rocking along. I really hope ours holds out for a few more years… :). Thanks so much for sharing! can’t go wrong with A Toyota product. Industructible and cheqp on gas. But Subies are fantastic as well. A recent article said they r cheap on gas and a tremendous bargain. Thanks! We are keeping an eye out for the market on used, southern state subarus… while still hoping we get a couple more years out of the van! I love my 1996 Honda accord! It was a college graduation present from my parents in 2000 (yes, I’m lucky) that with sporadic city driving has yet to reach 100k miles. Other than other drivers hitting it while parked, my biggest issue has been replacing the rusted through muffler twice – and it’s due again! I live in Chicago, with good public trans and decent bike lanes, so I’m not sure I’ll replace it when it finally gives out. Ours has suffered some body damage too, but nothing too serious. And since it’s not exactly worth a lot, we don’t feel any pressure to fix the dents! We just took our ’98 Odyssey to the scrap yard in return for a #3250 check from the Province of BC. Th reason for the big gift was we replaced it with an electric car (EV) , a used Nissan LEAF. The price of used LEAFs is rapidly dropping towards the $10,000 range and so by the time your van dies they should be very affordable. the street parking is an issue re getting power for the battery, but it can be done using pub;ic chargers. But for folks with a garage or car port this is really easy. I love the savings in gas and my kids and I are delighted that we are dropping our carbon emissions significantly this way. My wife still has her trusty Corolla so going on longer trips is no problem and as long as you get an EV (electric vehicle) with a fast charger port you will soon be able to get almost anywhere with 20 to 30 minute charging stops every 100 mies or so. We plan to switch our other car over in a couple of years time as the battery range improves on these amazing vehicles. This great new technology is not just for the Tesla crowd! How cool! I love the idea of EVs being more common, and the LEAF seems like a great car! This post is old, but I’ll reply anyway. I have consistently been told that Land Cruisers are THE most reliable vehicles. Other Toyotas as well. Google for ‘most reliable vehicle’ and ‘land cruiser’ or ‘toyota’ and it’ll confirm this. I found a really good scientific article about it a few months ago but can’t seem to locate it now. Anecdotally, I drove my ’96 Accord into the ground (I was in high school/uni and had no idea how to maintain a car!) and it still survived. 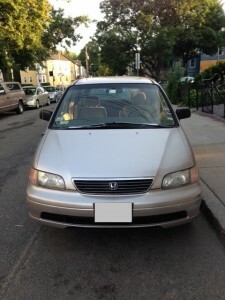 I then used public transit for 5 years until bought a ’97 Saturn sedan last year and it lasted SIX MONTHS. Worst decision ever. I thought I could trust the family-friend mechanic I bought it from, but the motor went out. I currently have a ’99 Durango that’s horrible on gas, but a better fit for my kiddo anyway. Land cruisers are awesome, but not so great on the gas mileage. I’ve also heard that parts for the older ones can be tough to find or expensive. Watch out for repairs on that Durango! My brother has one about the same vintage and it’s been a bit of a money pit! 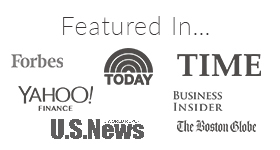 Sounds like you received great recommendations. I think your van is great – I tried to find something similar a few months ago – I live less than an hour from the highest (and coolest) peak in the NC mountains so I was going to use it for camping. Lots of people have converted vans for camping which would be very fun and cheap entertainent and that van would make it easy for my two old guys – Will (17 yrs) and Emma (13) yrs to get into. I still might do that. I bought my Jeep Cherokee in 1998 (its a 1997 and sat on the lot for a year because no one wanted an all manual car -mostly transmission). It has 196,000 miles and I’ve hauled my free and used furniture home in it too. Now those Jeeps are harder to come by. I have no plans of ever getting rid of my Jeep – my two girls grew up in it. I do need a second car and after much research have learned that the best cars to buy are those like Buick LeSabre (yes the kind the really old guys drive around). They are driven carefully and taken well care of by that group. Anyway for my 3000.00 budget, it is the best deal I’ve found – these cars are so uncool no one wants them – sounds like my kind of car. For 3000.00 I can get a very comfy well kept car with just over 100,000. For 3000.00, the Honda Accords, Jeeps, Toyotas are all over 300,000 and in not great shape. Not at all what I had in mind but it makes sense for me. AND they get more mileage than my Jeep. 25 mpg vs 20 for my Jeep. I know this isnt’ what you need once again you are doing the right thing – keeping your options open. I’ll take a look into the Buicks, I’m certainly not above driving a granny-mobile! We have a Honda Fit and it has great cargo space for a small car, and it gets great gas mileage in city driving. Another car to consider is the Toyota Matrix. Great gas mileage and nice cargo area. Good to know! Those are definitely both on our list–especially the Honda Fit. I’m currently trying to decide between a used Toyota Highlander or a used Toyota Sienna. I’ve never owned a van but my son had a (company) van, Sienna, and it was awesome. I too live very close to Boston and my current Corolla (2009/64,000 miles) is not good in the snow and it’s small. My significant other has spine and leg problems and has a difficult time getting in and out of it. I want space! I LOVE roadside finds and get very unhappy when I can’t fit it in my Corolla! I owned a highlander before the corolla and loved it but I loved the Sienna as well…any thoughts to help me decide. How does the van handle in snow? Thanks for any input. Our van does pretty darned good in the snow. Front wheel drive combined with a solid understanding of the physics involved in snowy driving has done well for us during the past 3 years. I think if we didn’t live *right* in the middle of the city (where the plowing is really good) we’d probably put snow tires on for the extra traction. As it is, we’ve never felt like we needed to do that. From what I’ve been told by my lifelong new englander friends… a good set of snow tires on a front wheel drive car will beat all weather tires on a four wheel drive car. Your mileage may vary, of course! I second the Toyota Sienna vote! We drove ours to 200K miles (in only 8 years! ), and it was actually still running pretty well when we got rid of it. Liked it so much, we bought another one! If we didn’t travel so much to see family and needed to be absolutely sure it could reliably make a 600-700 mile round trip visit without causing problems, (as you know, don’t want to be stranded in the-middle-of-nowhere-KS, and even worse if it’s in the snow with 3 kids), I would have kept it a lot longer. Unlike a lot of vans/crossovers/SUVs, the Sienna has a good sized cargo well, so even with all 3 rows of seats up, you can fit a lot in the back (when my kids were little, my test was whether my good stroller would lay flat in the well). We’ve moved kids back and forth to college in it several times, so I can vouch for the ample space. You’ve got a little time before you need to do that 🙂 Whenever you decide it’s time to T-R-A-D-E her in (if I spell it, she won’t catch on, right? ), hope you can find exactly what you’re looking for! Older post, but thought I would comment. Every one of my friends in high school, as well as three teachers, all had Honda Civics ranging from ’96-’99. All of ours have exceeded 200,000+ miles and are still running as if they have at least another good 100,000+ left. Mine was a ’99 that I purchased by myself for my 16th birthday at 50,000 miles. As long as you make sure to change their oil on time and everything, I have only ever had to invest in getting a few minor things fixed in the last ten years that totaled at under $350. They are amazing cars to drive parkways with and to take adventuring. I lived right off the blue ridge parkway and my car has yet to meet a hill that has intimidated it, or a snow storm it couldn’t power through. I wouldn’t knock them until you tried them either on storage capacity. I would pack my entire dorm room up and be able to stuff everything in the back seat and the trunk. Good for pups too, my golden never complains 🙂 Plus, they tow anything behind on any trailer and still get 27+ MPG. I average out at about 40 highway and 35 city driving back and forth from work. We too lived the boston area life before moving to VT in 2012. Our main vehicle at the time was a 2005 volvo xc70. We enjoyed the subway system and walking so the car was used mainly for weekend errands and our frequent trips to VT. Fast forward 3.5 years and 60K and my wife still drives the car today with 130k on it, albeit we’ve started to put a LOT of money/work into it. We live on a dirt road now. Not a long one, a mile at most. But she drives it every day, in additional to the typical bumpy paved VT roads. Our car has taken a beating to the suspension and has eaten through tires quickly as well. I don’t have any great car recommendations for you, but be aware that where you live in VT will probably do a good number on your car. Account for that when you do your planning for yearly maintenance, etc. Good luck! Yep, I can believe that the roads there will do a number on cars. Many of the places we’ve looked at are on dirt roads, and I know from experience how much that tends to rough up vehicles over time. Thanks for the advice, much appreciated! I love cars and I also like to be frugal. I have a 2007 VW Passat wagon because wagons are about the best all-around vehicle (except maybe a minivan). My Great Pyrenees and roommate’s Rottweiler love the puppy-hauler. Let me preface this by saying the ONLY reasons I have a european car is because it was cheap (4,400 + 900 timing belt) and there aren’t a bunch of wagons in the US. I drive very little and my roommate is a mechanic to keep maintenance costs down. I plan to keep it for 5 years then buy a 2011 Acura TSX wagon. I’m targeting a 150k mileage to be priced around $6,500 by then being a 10-year-old car. Both of my cars will cost less than yours. My point is for as little as you care about looks (I do), performance (I do, but I’m changing), comfort (I do), $9k is way too much to spend on a car. You’d be better off getting cars for $5k and driving them for 5-6 years. They’ll be a little older, but not much. If you really do want to spend at the top end of your range, I suggest stretching the ole Frugalwoods-mobile 4 more years and looking at a used 2012 Prius V. When it’s 7 years old it could be around $9k but should last you 15 more years at least. Good luck. Love the blogs. I own a 2008 Honda Fit, but am currently not driving it as it’s too expensive to park in SF. I did a lot of research regarding longevity and had mileage and at the time it was the best “bang for my buck”. It currently only had 30k miles on it and is paid off. I did have some problems with the battery resetting and not passing smog due to faulty electronics (but nothing wrong with the car). Downside – it’s fairly lightweight and may not be the safest especially if you are considering children. Love how the interior configures in multiple positions though – for a small car t is roomy. We adoooooore our Subaru. However, my brother’s Toyota Camry is still going strong at 208k and my last Subaru was upgraded at 150k (I drive 60+ miles every day so can’t get stranded). It’s the official car of Vermont and retail market is very strong. Luckily, my husband is a mechanic which is one of the ultimate frugal moves (free labor and just pay for parts!). His cars regularly are over 10 years old and 150k but they tend to have limited lifespans due to the wear and tear he puts on them plowing. He does not like any of the tiny cars due to damage he saw in school and at dealerships. I’ve been rearended a few times (woo driving on the highway) and my Subaru is always in much better shape than the sedans that hit me. Honda, Honda, HONDA! Haters gonna hate, but you have to admit this brand goes the distance, and I do means hundreds of thousands of miles. Between my husband and myself we have owned 8 Hondas, 3 Toyotas and a short-list of American cars. We buy all used cars off of Craigslist now, but were new car buyers in our earlier days. Love those Hondas! They are worth a little more because you do not pay nearly as much for repairs over the life of ownership. 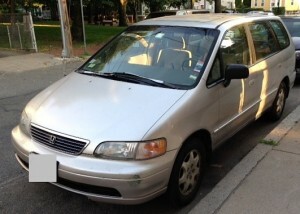 I bought a new 99 Honda Odyssey and had it for 13 years, 200,000 miles and only sold it once I was an almost-empty nester. I had a 98 Honda Odyssey van, same color, I loved it for a year until the transmission went out. I still was able to sell for $2500 and then buy a $4500 with cash. I now drive a 2005 Chevy Malibu Maxx which gets great gas mileage. Only about $45 to fill up and since i work from home I only spend around $90 a month or less on gas. Car payments keep you broke people. With the money I save I was able to start a business. I would not have been able to otherwise. Car payments are the swcond biggest expense for most people. Freeing up that cash on a monthly basis is quite literally freeing yourself feom a life you hate. What if you could change your life with an extra $400 a month. I did! Ford Crown Victoria Police Interceptor 1995 with 425,000 before I cooked the motor. Hint, Work on your own cars, like seriously, the $100 to take the Auto class at your local community college will pay for itself when you change your own spark plugs alone. The reason to buy a domestic is again the price of parts. I can replace a brand new engine and transmission assembly on the Dodge (A 5.7L V8) for the price of most Honda engines. Honda is good, but the import costs and availability of the older cars makes a DIY sometimes harder.A good place to learn these tricks for free would be finding an old guys car club and volunteering an extra hand with rebuilding the cars. They need the muscles sometimes to list and old block out or replace glass etc. Once you prove your salt then not only do they always help you out but they are the best teachers and have the rolodex filled with the cheaper places to find parts. Hope this helps! I love your blog. I live on $500/month sans my student loans here in california. It pays for my medical school just working a normal full time nursing job. I’ll be graduating med school with $0 student debt. And I grew up homeless. This is what America needs. More people like y’all.